The French community in Galway has been moved by the expressions of solidarity it has received from Galwegians over the last number of days, following the Charlie Hebdo killings which left 17 people dead. Last week, few, if anybody, outside of France had heard of Charlie Hebdo. Following the slaying of 12 members of staff by the extremist Kouachi brothers, who would kill more people before they themselves were gunned down, everybody now knows its name. For many, the magazine and the slogan ‘Je Suis Charlie’ have become emblems of ‘freedom of expression’. 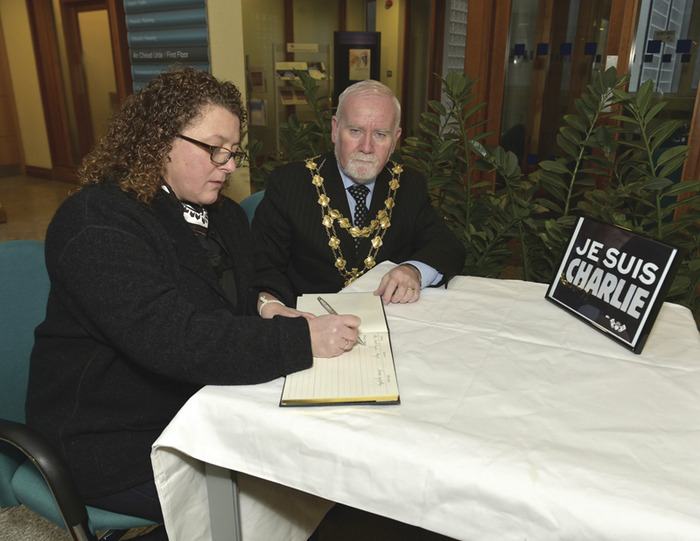 The French community, which numbers between 600 to 1,000 across Galway city and county - responded on Sunday by holding a ‘Je Suis Charlie’ event at the Spanish Arch, which saw them joined by hundreds of Galwegians wishing to show solidarity at a time of national tragedy. Ms Gangeaux said she and the French community were shocked and angered by the killings, but also took heart from the solidarity the world has shown. The killings have been condemned by many French Muslims, thousands of whom took part in the Paris march last Sunday, while many others, who, though finding the cartoons of the Prophet Muhammad offensive, were disgusted by the actions of the Kouachis. Many Arab newspapers and Muslim cartoonists penned images in support of free expression and against Islamic State. Interestingly, Hezbollah also came out during the week condeming the murder of the cartoonists. “That shows how the Muslim community understands that violence is not the answer and that freedom of expression is something sacred,” said Ms Gangeaux. The Charlie Hebdo killings has raised questions regarding the delicate balance between freedom of expression and the freedom to insult, and if there are limits in regard to either. Many Muslims genuinely find the cartoons offensive, but the French people themselves know what it is like to be ridiculed - especially during the Bush administration in the US, when Republicans indulged in disgusting and xenophobic taunts of ‘cheese eating surrender monkeys’. Like many French people, Miss Gangeaux is fearful there may be more attacks along the lines of those perpetrated by the Kouachis, but, she says, the message must be that such people cannot be allowed to hold sway over others.